Surrounded by the bustling city of West Hollywood, Levine Park offers a serene resting spot for patrons and local pedestrians. Cedars-Sinai is reimagining its campus by combining native, soft vegetation and modern, contemporary lines and hardscape. This project has established a visual identity that can be translated across the campus. The park is located at a very visible front door to the campus. The plan creates dynamic lines that invite pedestrians from the sidewalk and onto the Cedars-Sinai Medical Center campus. To create a vibrant, yet peaceful experience, the design weaves together strong urban design features with a soft and native plant palette. The result is an amenity that responds to the economic, social and natural context of the place. The park includes a seatwall, several planters, and a hedge and fence that encircle the cancer center parking lot. Native vegetation is carefully used in a sculptural and contemporary manner. When this plant palette is paired with finely finished concrete, stainless steel and warm woods, the result is modern, yet inviting. Though this park is located at a visible edge of the campus, people in this space feel secluded and safe. 1,500 sq. ft. / 140 sq. m.
See the Cedars-Sinai campus on Google Street View. 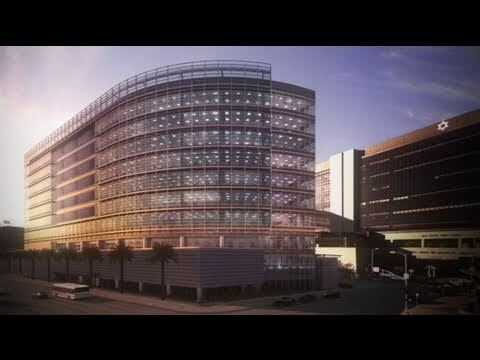 The pavilion exemplifies Cedars-Sinai’s commitment to state-of-the-art research and high quality, compassionate healthcare.